This is a complex dish, its gusty flavours underpinned by base notes of onion, capsicum and celery with the usual spices adding kick. 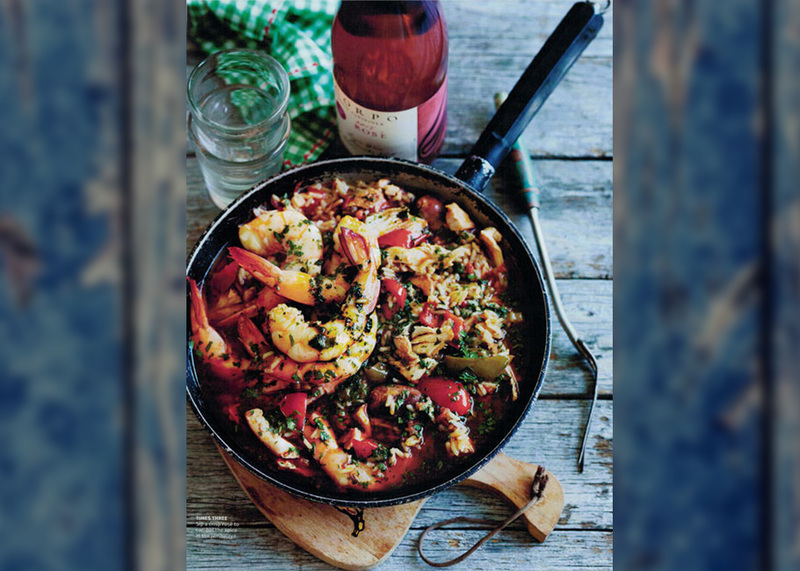 The trio of protein (sausage, chicken and prawns) are unified by the rice in this Southern take on a Spanish paella. This crisp, flavoursome Rose integrates nicely with the recipe – its pinot noir base adding charm. The 2015 Scorpo exudes fresh raspberry and strawberry flavours, its fruitiness cut by a whisper of tannin in harmony with the jambalaya. 1. Season chicken pieces with sea salt and freshly ground black pepper and cayenne. 2. Heat olive oil in a large casserole dish over a medium heat and brown chicken pieces and sausage for about 5 minutes, turning occasionally. Transfer with a slotted spoon to a bowl. 3. Add onion, garlic, capsicum, celery, bay leaves, thyme, paprika and half parsley to pan. Sauté for 10-12 minutes over a low heat stirring occasionally until softened. Add chicken and sausage back to the pan. Then add tomatoes and chicken stock., bring to the boil then reduce heat to low and simmer covered for 30 minutes. 4. Remove chicken from sauce with a slotted spoon and allow to cool. 5. Add rice to the saucepan and cook for about 15-20 minutes until tender, stirring occasionally. 6. Meanwhile shred chicken meat off the bone into a bowl. 7. Once rice is cooked, add prawns and cook for a few minutes or until pink. Add shredded chicken. Stir well, add a little extra water if mixture is too dry, and cook for a few extra minutes before serving. 8. Transfer to plates, sprinkle with remaining parsley and serve with a green salad.